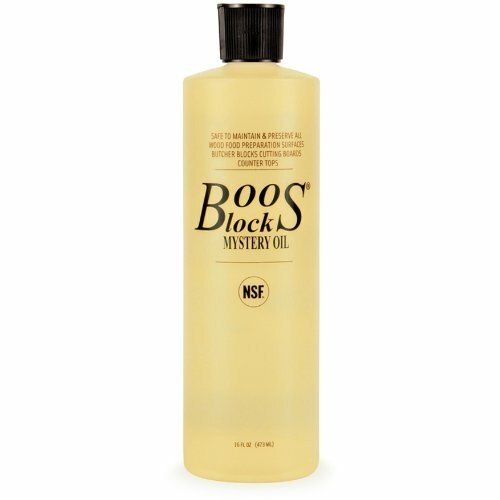 Keep the wood in your kitchen looking beautiful and new with this set of eight bottles of John Boos block mystery oil. Formulated from all natural ingredients such as white mineral oil and beeswax, this oil penetrates deeply and quickly into the grains of the wood. The oil will lock in moisture and leave your surfaces looking brand new. When used regularly, this oil will replenish and revitalize the moisture that can be lost through repeated washing, and will prevent drying, bleaching, and cracking of your wood. The mystery oil is perfect for use on wood cutting boards, butcher blocks, and even wooden utensils. Best of all, it is made in the USA, and is backed by a one year manufacturer's warranty.